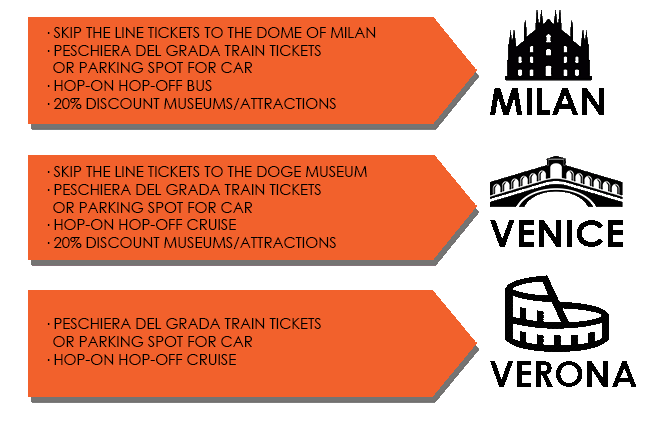 INCLUDES: skip the line tickets for the best museum in each city, 2-WAY TRANSFER BY TRAIN FROM PESCHIERA DEL GARDA TO MILAN/VENICE/verona, or a parking spot in one of these cities, HOP ON HOP OFF BUS/cruise AND 20% DISCOUNT WHEN YOU WANT TO VISIT MORE MUSEUMS, ATTRACTIONS OR EXCURSIONS! But of all these cities have more common. They are hectic cities with many challenges to be able to enjoy your city trip. There are many waiting lines for museums while you only have limited time. Attractions are not located within walking distance. Traffic is hectic and parking expensive and difficult to find. The ultra-convenient Garda Lake City Pass includes skip-the-line entrance to the city’s most famous destinations, 2-way train transfer from Peschiera del Garda to Milan, Venice or Verona or a parking spot valid for 1 day in one of these cities. And you get discounts to countless further attractions. Even better, you receive everything by email so that you don’t waste time picking it up when you arrive. When you travel by train you will stop at Stazione Milan Centrale. Here you can take the Hop on Hop off Bus. You will get an exact map where the bus departures and how to walk to this stop. The Hop on Hop off Bus will take you to all the major important stops from Milan like Cenacolo (where the Last Supper of Leonardo da Vinci is exhibited), Brera and San Siro Stadium. You can hop on and off to the locations you like. The bus also stops at the Dome of Milan. When you travel by car your parking garage will be near the Dome of Milan. Information like the address of the parking garage and how it works you will receive after your reservation. When you travel by train you will stop at Venezia Sant Lucia. From here you can take the Hop on Hop off Cruise which will also stop at Tronchetto, Murano, Zattere and San Marco. At San Marco, you can hop off to visit the Doge Museum. At the end of the day, you can use the cruise to get back to Sant Lucia again to take your train back to Peschiera del Garda. When you travel by car your parking garage will be near Central Station as well. When you travel by car you can park your car at the Port of Venice where the Hop on Hop off Cruise will departure from as well. When you travel by train you will stop at Central Station (Porta Nuova). Here you can take the Hop on Hop off Bus. You will get an exact map where the bus departures and how to walk to this stop. The Hop on Hop off Bus will take you to all the major important stops from Verona like Piazza Bra, Castelvecchio, Teatro Romano, the grave of Juliette of the story Romeo and Juliette and the Dome of Verona. When you travel by car your parking garage will be near Teatro Romano where you can hop on at the Hop on Hop off Bus with your ticket. • Everything will be sent by email. • Don´t miss out important highlights. With the Hop on Hop off flexibility, you can hop on and off at the most important ones. The Garda Lake City Pass is everything you need for your city trip to Milan/Venice/Verona!